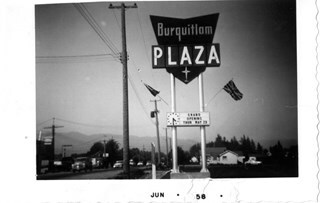 "Buildings - Commercial - Malls"
Photograph of the sign for "Burquitlam Plaza" and the "Grand Opening on Thursday May 29". This mall is located at 526 Clarke Road. Cars can be seen parked and driving along Clarke Road out in front of the mall. 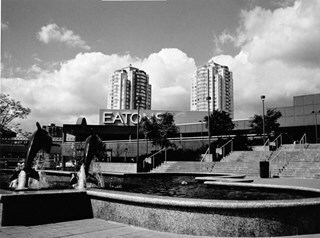 Photograph of the exterior of Eaton Centre and fountain at Metrotown mall. 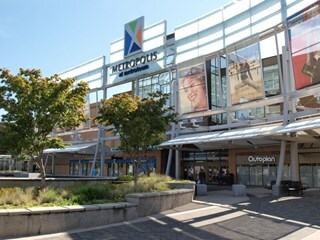 Photograph shows the mall entrance to Brentwood Mall at Willingdon Avenue and Lougheed Highway. 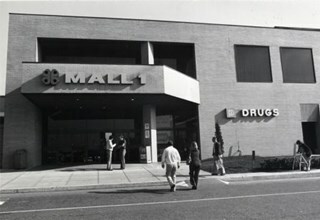 The mall was designed by E. J. Watkins, architect, for Webb & Knapp and built in 1961. 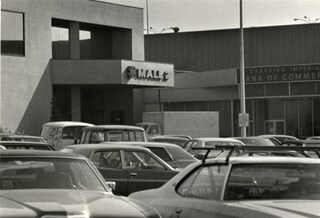 Photograph shows the second mall entrance to Brentwood Mall. 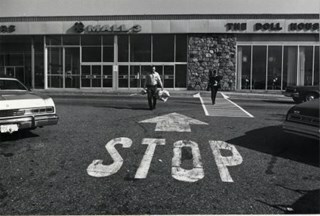 Photograph shows the third mall entrance to Brentwood Mall. 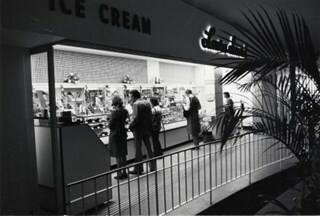 Photograph shows the Laura Secord Candy Shop inside Brentwood Mall. 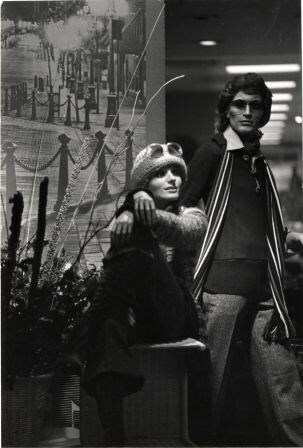 Photograph shows mannequins at Eaton's store in Brentwood Mall. 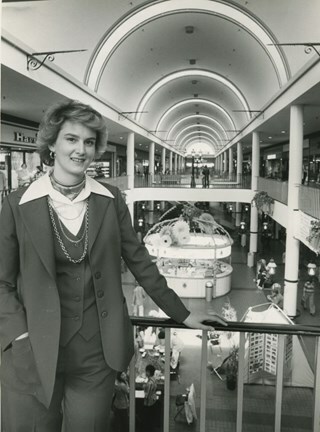 Photograph of Lougheed Mall (now Lougheed Town Centre) promotions coordinator, Margaret Roberts, standing with her hand on the railing of the mall walkway. Photograph of a young girl walking down a runway in front of an audience. 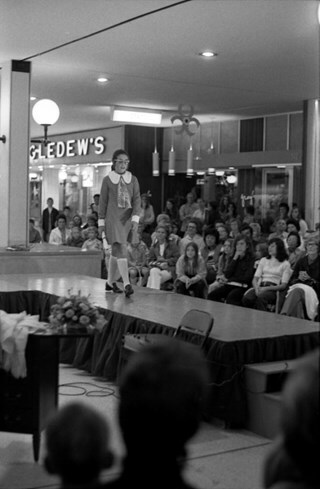 The photograph was taken in the Brentwood Mall during a fashion show and a number of stores can be seen in the background. Photograph is a panoramic view of the Brentwood Shopping Centre, taken from the parking lot. 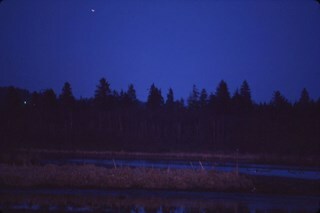 File consists of scenic photographs of Burnaby Lake at sunset and nighttime with the Lougheed Mall skyline lit up in the distance. 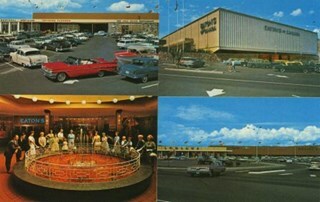 Postcard cosisting of four photographs of Brentwood Shopping Centre. 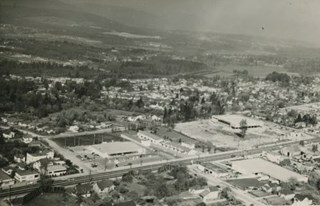 The description printed on the back of the postcard reads, "Brentwood Shopping Centre / Lougheed and Willingdon, Burnaby, B.C. Free parking for 2500 cars. Eaton's of Canada - three floors of air-conditioned shopping comfort. Fountain Square. Loblaw's ... B.C. 's Largest Supermarket." The cost to mail the postcard is listed as four cents. Some of the stores visible are: Bank of Montreal, Heywood Floors, The Doll House Restaurant, Eaton's of Canada, Loblaws, Fields, and Zeller's. Printed on back of postcard: "Pub, by Natural Color Productions, Ltd., Vancouver, B.C.," "Made in Canada, Grant-Mann," and "GM: Lithography, Photography, Design"